The Baudot code [bodo], invented by Émile Baudot, is a character set predating EBCDIC and ASCII. It was the predecessor to the International Telegraph Alphabet No. 2 (ITA2), the teleprinter code in use until the advent of ASCII. Each character in the alphabet is represented by a series of five bits, sent over a communication channel such as a telegraph wire or a radio signal. The symbol rate measurement is known as baud, and is derived from the same name. Replaced by ITA2 (not mutually compatible). Technically, five-bit codes began in the 17th century, when Francis Bacon developed the cipher now called Bacon's cipher. The cipher was not designed for machine telecommunications (it was instead a method of encrypting a hidden message into another) and, although in theory it could be adapted to that purpose, it only covered 24 of the 26 letters of the English alphabet (two sets of letters, I/J and U/V, were expressed with the same code) and contained no punctuation, spaces, numbers or control characters, rendering it of little use. Baudot invented his original code in 1870 and patented it in 1874. It was a 5-bit code, with equal on and off intervals, which allowed for transmission of the Roman alphabet, and included punctuation and control signals. It was based on an earlier code developed by Carl Friedrich Gauss and Wilhelm Weber in 1834. It was a Gray code (when vowels and consonants are sorted in their alphabetical order), nonetheless, the code by itself was not patented (only the machine) because French patent law does not allow concepts to be patented. Baudot's original code was adapted to be sent from a manual keyboard, and no teleprinter equipment was ever constructed that used it in its original form. The code was entered on a keyboard which had just five piano-type keys and was operated using two fingers of the left hand and three fingers of the right hand. Once the keys had been pressed, they were locked down until mechanical contacts in a distributor unit passed over the sector connected to that particular keyboard, when the keyboard was unlocked ready for the next character to be entered, with an audible click (known as the "cadence signal") to warn the operator. Operators had to maintain a steady rhythm, and the usual speed of operation was 30 words per minute. The table "shows the allocation of the Baudot code which was employed in the British Post Office for continental and inland services. A number of characters in the continental code are replaced by fractionals in the inland code. Code elements 1, 2 and 3 are transmitted by keys 1, 2 and 3, and these are operated by the first three fingers of the right hand. Code elements 4 and 5 are transmitted by keys 4 and 5, and these are operated by the first two fingers of the left hand." Baudot's code became known as the International Telegraph Alphabet No. 1 (ITA1). It is no longer used. In 1901, Baudot's code was modified by Donald Murray (1865–1945), prompted by his development of a typewriter-like keyboard. The Murray system employed an intermediate step; a keyboard perforator, which allowed an operator to punch a paper tape, and a tape transmitter for sending the message from the punched tape. At the receiving end of the line, a printing mechanism would print on a paper tape, and/or a reperforator could be used to make a perforated copy of the message. As there was no longer a connection between the operator's hand movement and the bits transmitted, there was no concern about arranging the code to minimize operator fatigue, and instead Murray designed the code to minimize wear on the machinery, assigning the code combinations with the fewest punched holes to the most frequently used characters. For example, the one-hole letters are E and T. The ten two-hole letters are AOINSHRDLZ, very similar to the "Etaoin shrdlu" order used in Linotype machines. Ten more letters have three holes, and the four-hole letters are VXKQ. The Murray code also introduced what became known as "format effectors" or "control characters" – the CR (Carriage Return) and LF (Line Feed) codes. A few of Baudot's codes moved to the positions where they have stayed ever since: the NULL or BLANK and the DEL code. NULL/BLANK was used as an idle code for when no messages were being sent, but the same code was used to encode the space separation between words. Sequences of DEL codes (fully punched columns) were used at start or end of messages or between them, allowing easy separation of distinct messages. (BELL codes could be inserted in those sequences to signal to the remote operator that a new message was coming or that transmission of a message was terminated). In 1924, the CCITT introduced the International Telegraph Alphabet No. 2 (ITA2) code as an international standard, which was based on the Western Union code with some minor changes. The US standardized on a version of ITA2 called the American Teletypewriter code (US TTY) which was the basis for 5-bit teletypewriter codes until the debut of 7-bit ASCII in 1963. Some code points (marked blue in the table) were reserved for national-specific usage. The code position assigned to Null was in fact used only for the idle state of teleprinters. During long periods of idle time, the impulse rate was not synchronized between both devices (which could even be powered off or not permanently interconnected on commuted phone lines). To start a message it was first necessary to calibrate the impulse rate a sequence of regularly timed "mark" pulses (1) by group of five pulses, which could also be detected by simple passive electronic devices to turn on the teleprinter; this series of pulse was generating series of Erasure/Delete and also initializing the receiver state to the Letters shift mode, however the first pulse could be lost, so this power on procedure could then be terminated by a single Null immediately followed by an Erasure/Delete character. To preserve the synchronization between devices, the Null code could not be used arbitrarily in the middle of messages (this was an improvement to the initial Baudot system where spaces were not explicitly differentiated, so it was difficult to maintain the pulse counters for repeating spaces on teleprinters). But it was then possible to resynchronize devices at any time by sending a Null in the middle of a message (immediately followed by an Erasure/Delete/LS control if followed by a letter, or by a FS control if followed by a figure). Sending Null controls also did not cause the paper band to advance to the next row (as nothing was punched), so this saved precious lengths of punchable paper band. On the opposite the Erasure/Delete/LS control code was always punched and always shifted to the (initial) letters mode. According to some sources, the Null code point was reserved for country-internal usage only. The Shift to Letters code (LS) is also usable as a way to cancel/delete text from a punched tape after it has been read, allowing a safe destruction of the message before recycling the punched band. For that function, it also plays the same role of filler as the Delete code in ASCII (and also in other 7-bit or 8-bit encodings, including EBCDIC for punched cards). Once codes for a fragment text has been replaced by arbitrary number of LS codes, what follows is still preserved and decodable. It can also be used as an initiator to make sure that the decoding of the first code will not give a digit or another symbol from the figures page (because the Null code may be arbitrarily inserted near the end of a punch band or at start of it, and has to be ignored, whereas the Space code is significant in text). 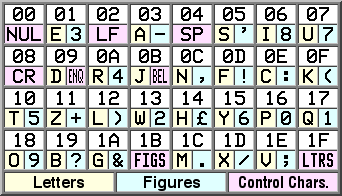 The cells marked as reserved for extensions (using the LS code again from the letters shift page, just after a first LS code to shift from the figures page) has been defined to shift into a new mode: in this new mode, the letters page are containing lowercase letters only, but a third page of codes is still accessible for the uppercase letters, either temporarily for a single letter (encode LS before that letter), may be locked (with FS+LS) for an unlimited number of capital letters or digits and then unlocked to return to lowercase mode (with a single LS). The cell marked as "Reserved" is also usable (using the FS code from the figures shift page) to switch the page of figures (which normally contains digits and national lowercase letters or symbols) to a fourth page (where national letters are uppercased and other symbols may be encoded). ITA2 is still used in telecommunications devices for the deaf (TDD), telex, and some amateur radio applications, such as radioteletype ("RTTY"). ITA2 is also used in Enhanced Broadcast Solution (an early 21st century financial protocol specified by Deutsche Börse) to reduce the character encoding footprint. Nearly all 20th-century teleprinter equipment used Western Union's code, ITA2, or variants thereof. Radio amateurs casually call ITA2 and variants "Baudot" incorrectly, and even the American Radio Relay League's Amateur Radio Handbook does so, though in more recent editions the tables of codes correctly identifies it as ITA2. NOTE: This table presumes the space called "1" by Baudot and Murray is rightmost, and least significant. The way the transmitted bits were packed into larger codes varied by manufacturer. The most common solution allocates the bits from the least significant bit towards the most significant bit (leaving the three most significant bits of a byte unused). In ITA2, characters are expressed using five bits. ITA2 uses two code sub-sets, the "letter shift" (LTRS), and the "figure shift" (FIGS). The FIGS character (11011) signals that the following characters are to be interpreted as being in the FIGS set, until this is reset by the LTRS (11111) character. In use, the LTRS or FIGS shift key is pressed and released, transmitting the corresponding shift character to the other machine. The desired letters or figures characters are then typed. Unlike a typewriter or modern computer keyboard, the shift key isn't kept depressed whilst the corresponding characters are typed. "ENQuiry" will trigger the other machine's answerback. It means "Who are you?" Note: the binary conversions of the codepoints are often shown in reverse order, depending on (presumably) from which side one views the paper tape. Note further that the "control" characters were chosen so that they were either symmetric or in useful pairs so that inserting a tape "upside down" did not result in problems for the equipment and the resulting printout could be deciphered. Thus FIGS (11011), LTRS (11111) and space (00100) are invariant, while CR (00010) and LF (01000), generally used as a pair, are treated the same regardless of order by page printers. LTRS could also be used to overpunch characters to be deleted on a paper tape (much like DEL in 7-bit ASCII). The sequence RYRYRY... is often used in test messages, and at the start of every transmission. Since R is 01010 and Y is 10101, the sequence exercises much of a teleprinter's mechanical components at maximum stress. Also, at one time, fine-tuning of the receiver was done using two coloured lights (one for each tone). 'RYRYRY...' produced 0101010101..., which made the lights glow with equal brightness when the tuning was correct. This tuning sequence is only useful when ITA2 is used with two-tone FSK modulation, such as is commonly seen in radioteletype (RTTY) usage. US implementations of Baudot code may differ in the addition of a few characters, such as #, & on the FIGS layer. The Russian version of Baudot code (MTK-2) used three shift modes; the Cyrillic letter mode was activated by the character (00000). Because of the larger number of characters in the Cyrillic alphabet, the characters !, &, £ were omitted and replaced by Cyrillics, and BEL has the same code as Cyrillic letter Ю. The Cyrillic letters Ъ and Ё are omitted, and Ч is merged with the numeral 4. ^ a b c d "At the disposal of each administration for its internal service"
^ a b "[G]ives invisible correction on page printers & * on slip printers." ^ "Jean-Maurice- Emile Baudot. Système de télégraphie rapide, June 1874. Brevet 103,898; Source: Archives Institut National de la Propriété Industrielle (INPI)". ^ H. A. Emmons (1 May 1916). "Printer Systems". Wire & Radio Communications. 34: 209. ^ William V. Vansize (25 January 1901). "A New Page-Printing Telegraph". Transactions. American Institute of Electrical Engineers. 18: 22. ^ "Gauss-Weber-Telegraph". Metrology Mile (in German). Measurement Valley. Retrieved 3 May 2009. ^ Pickover, Clifford A. (2009). The Math Book: From Pythagoras to the 57th Dimension, 250 Milestones in the History of Mathematics. Sterling Publishing Company. p. 392. ^ Gleick, James (2011). The Information: A History, a Theory, a Flood. London: Fourth Estate. p. 203. ISBN 978-0-00-742311-8. ^ Foster, Maximilian (August 1901). "A Successful Printing Telegraph". The World's Work: A History of Our Time. II: 1195–1199. Retrieved 9 July 2009. ^ Telegraph and Telephone Age. 1921. I allocated the most frequently used letters in English language to the signals represented by the fewest holes in the perforated tape, and so on in proportion. ^ "BruXy: Radio Teletype communication". 10 October 2005. Retrieved 9 May 2016. The transmitted code use International Telegraph Alphabet No. 2 (ITA-2) which was introduced by CCITT in 1924. ^ Smith, Gil (2001). "Teletype Communication Codes" (PDF). Baudot.net. Archived (PDF) from the original on 20 August 2008. Retrieved 11 July 2008. ^ a b Steinbuch, Karl W.; Weber, Wolfgang, eds. (1974) . Taschenbuch der Informatik - Band III - Anwendungen und spezielle Systeme der Nachrichtenverarbeitung. Taschenbuch der Nachrichtenverarbeitung (in German). 3 (3 ed.). Berlin, Germany: Springer Verlag. pp. 328–329. ISBN 3-540-06242-4. LCCN 73-80607. ^ "Enhanced Broadcast Solution – Interface Specification Final Version" (PDF). Deutsche Börse. 17 May 2010. Retrieved 10 August 2011. ^ a b c d e f g h i j "Five-unit codes". NADCOMM museum. Archived from the original on 4 November 1999. ^ Jennings, Tom (20 April 2016). "An annotated history of some character codes: ITA2". Retrieved 20 January 2018. […] the characters that are ‘transmission control’ related […] are bit-wise symmetrical — the codes for FIGS, LTRS, space and BLANK — are the same reversed left to right! Further, the codes for CR and LF, equal each other when reversed left to right! Hobbs, Alan G. "NADCOMM Papers and Writings: Five-unit codes". Retrieved 10 February 2017. Jennings, Tom (2016). "An annotated history of some character codes: Baudot's code". Retrieved 20 January 2018. "Jean-Maurice-Émile Baudot". Archived from the original on 13 September 2009. Asynchronous serial communication is a form of serial communication in which the communicating endpoints' interfaces are not continuously synchronized by a common clock signal. Instead of a common synchronization signal, the data stream contains synchronization information in form of start and stop signals, before and after each unit of transmission, respectively. The start signal prepares the receiver for arrival of data and the stop signal resets its state to enable triggering of a new sequence. A common kind of start-stop transmission is ASCII over RS-232, for example for use in teletypewriter operation. A bell code (sometimes bell character) is a device control code originally sent to ring a small electromechanical bell on tickers and other teleprinters and teletypewriters to alert operators at the other end of the line, often of an incoming message. Though tickers punched the bell codes into their tapes, printers generally do not print a character when the bell code is received. Bell codes are usually represented by the label "BEL". They have been used since 1870 (initially in Baudot code).To maintain backward compatibility, video display terminals (VDTs) that replaced teletypewriters included speakers or buzzers to perform the same function, as did the personal computers that followed. Modern terminal emulators often integrate the warnings to the desktop environment (e.g., the Mac OS X Terminal will play the system warning sound) and also often offer a silent visual bell feature that flashes the terminal window briefly. Donald Murray (1865–1945) was an electrical engineer and the inventor of a telegraphic typewriter system using an extended Baudot code that was a direct ancestor of the teleprinter (teletype machine). He can justifiably be called the "Father of the remote Typewriter".Murray's system became the International Telegraph Alphabet No. 2 (ITA2) or Murray Code; it was supplanted by the American Standard Code for Information Interchange (ASCII) in 1963.
the Model 33 RO (Receive Only) which has neither a keyboard nor a reader/punch.The Model 33 was one of the first products to employ the newly standardized ASCII code. A companion Model 32 used the more established five-level Baudot code. Because of its low price and ASCII-compatibility, the Model 33 was widely used with early minicomputers. 011·01 10·110 3 F Ф Э ! 100·01 10·001 2 Z З + "
110·01 10·011 3 B Б ? 111·00 00·111 3 M М .